The is part two if a three part series digging into the American net-net Solitron Devices. If you haven't read part 1 you can find it here. To me when investigating a net-net stock the most important thing to consider is the makeup of the assets and liabilities. A company that has most of it's market cap in aging inventory or the dubious "other current assets" is avoided for one that's market cap is cash and marketable securities. Solitron Devices is a great company to investigate for a few reasons, the first is that the balance sheet is very simple and clean. The second is the consistence of it's financial statements, and the third is the desirable composition of its assets historically. Before diving into the financial statement weeds I want to give a quick overview of Solitron's history which is very important to understanding it's current position. Solitron Devices was founded in 1959 and is head quartered in West Palm Beach Florida. The company grew by acquisition through the 60s, 70s and 80s. By the late 1980s the company had over 900 employees working at their Palm Beach facility. In the process of acquiring other companies it racked up a large amount of debt. Sales peaked for Solitron in 1987 and began declining. In 1988 the auditor letters began to include statements regarding the concern that Solitron would continue as a going concern. During this time the city of Riveria Beach sued the company and won an environmental damage lawsuit for $2.16m. The company had $23m in debt and only one profitable division the microwave division which it sold in 1989 for $8.5m to attempt to ward off a foreclosure. Solitron was able to avoid the foreclosure by restructuring it's $18.5m loan with Southeast bank into an extended $19m loan. At this point Solitron only had a few money losing divisions and not much hope. Amazingly they were able to limp along until 1992 when their facility caught on fire. Contrary to what might be floating on the internet environmental liabilities didn't do them in a facility fire did. The fire destroyed their manufacturing capability and insurance was slow to reimburse forcing them into bankruptcy. As part of the restructuring the company reduced debt from $22m down to $3m, moved from a 270,000 sq ft facility to a 60,000 sq ft facility and eliminated low margin products. While most of the debt was extinguished in the bankruptcy the environmental liabilities were not, and addition liabilities were incurred from the fire and cleanup involved. The company still had the money losing divisions and auditors who were warning as late as 1996 that the company probably wouldn't survive as a going concern without a liability restructuring. The company finally turned a profit starting in 1997 and began paying off its debt and rebuilding its balance sheet. So why does all this matter? When Solitron restructured they gained new management that had an aversion to debt and a desire to never fall back into the same mess as the past. I feel that knowing some of this history explains the balance sheet much better. The following graph shows the historical composition of Solitron's assets for the past five years. The biggest change is that in 2008 Solitron took their cash and bought a lot of Treasury Bills which at the time paid a decent interest rate but not so much anymore. 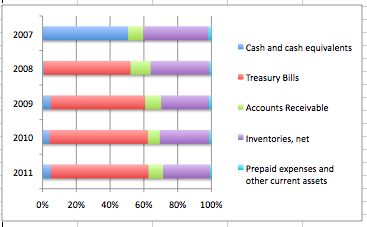 Otherwise cash and bills have been increasing, accounts receivable have remained steady and inventories have strunk slightly. The next graph shows the overall assets compared to current assets for the past five years. The trend is a good one, both current assets and assets are increasing. The increase in current assets is an increase in the Treasury Bills account, while the reason for the total asset increase is additions to the PP&E account. The next graph I believe really breaks down the balance sheet the best, it shows both asset and liability levels per year. 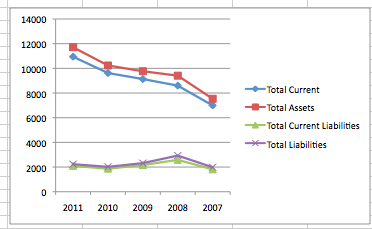 What we can see is that liabilities have stayed relatively flat while both asset accounts have increased nicely. Even while a net-net Solitron has been working to grow its book value. 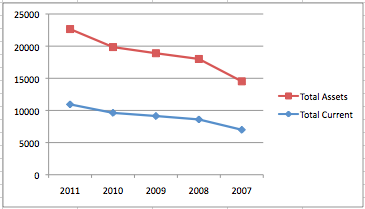 You can also see from the graph that Solitron has been trading close to or below it's NCAV since 2007. I don't have the market cap information on this chart but the price was in the $1-2 range. I think the great thing about this is that an investor didn't need the stock to ever trade at or above NCAV to have great returns. An investor buying in June 2007 would be siting on a 112% return in addition to a company that is growing it's cash balance and healthy. Not bad considering an investor putting money into the S&P at the same time is still sitting on a 13% decline. The liability story for Solitron is interesting, outside of a nominal amount of trade payables most of their liabilities reside in bankrupt accounts payable which amounts to $1030000. The company has an agreement to pay $7,000 per quarter until this liability is exhausted. The only other liability is related to the cleanup of former sites. The company is currently paying at a rate of $1,000 per month or $12,000 per year towards the cleanup costs. The company breaks down the cleanup costs as follows. Taking a look at this schedule the company will have exhausted the environmental liability in 2016 which would enable it to pay a dividend of some of the cash on the balance sheet. I have seen some comments on the internet that the environment liability might be paid off in 2013 but I can't find anything about this in the 10-k, if anyone has any information please leave it in the comments. The next post I will discuss the operating performance of Solitron Devices. Disclosure: Long Solitron and actively working to accumulate more shares. >>... I can't find anything about this in the 10-k, if anyone has any information please leave it in the comments. Thanks for the comment. I actually contacted the CEO about this and he clarified most of the issues surrounding the environmental liabilities. The amount is a negotiated amount to avoid a multimillion dollar upfront payment that the gov was asking for. In agreeing to this the company has to pay minimum payments and is restricted from paying dividends as you've noted. I asked if there was the potential to pay it off early and he said if they did they would be liable for the full original amount, so it's not a good idea. I also asked about any future dividends and he wouldn't commit to anything trotting out the line that they might only operate at break-even in the future so it would be foolish to commit to a dividend with future uncertainty. I can under stand the overly conservative nature of the business. The CEO came in to restore an overlevered declining business in the 90s. He's done well and a lot ofthat is from moving slowly and making prudent decisions. The bottom line, I'm pretty confident we'll see a dividend it will just be q yearly declared 'special dividend'.